Turns out, those library card pockets are really easy to make, and a little addictive. I would say that this stack of thirty--30!--pockets is pretty good evidence. I had an assembly line approach going throughout the day, and just did a step here and there when I had some time: pick the papers, draw the template, cut out the shape and fold, glue into place. Suddenly, I had this pile in front of me! When you give someone a book as a gift, you can include a library card pocket that you have decorated and embellished along with a library card that has your name, their name, the date, and a message. 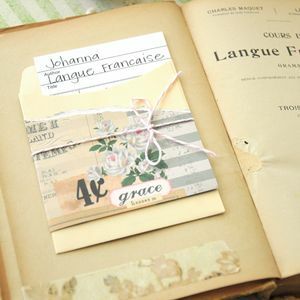 I've always loved including hand-made bookmarks with gift books, and I love this idea, as well. Now you HAVE to make some! As I was growing up, there were three things that I knew for sure I would be in my life: a teacher, a mother, and a writer. I formulated my teaching career goal at age four, and though I toyed briefly with other options (missionary, minister, journalist, architect), my teaching aspirations never really wavered. They gave me a very definite path to follow through college, and a sense of security as I worked through my Masters degree, my student teaching, and into a classroom of my own. Motherhood likewise felt like an assured path. I followed the great tradition of meeting my husband in college and marrying him halfway through my Masters degree. We delayed a family to establish my teaching and secure his doctorate. The Grand Plan got waylaid by circumstances that ended our marriage--the stuff of other stories--and I entered a four-year period of single life, searching, and maternal dreams put on hold. I would have to wait through another courtship, a second wedding, and two devastating miscarriages to finally realize that long-standing dream of motherhood. And then there were my expectations that I would be a writer. I kept a diary, wrote pre-adolescent poetry, wrote for my school newspaper, and edited the literary magazine. As an undergraduate English major, I continued merrily along my path. That is, until I interviewed for the staff of the college literary magazine and was soundly rejected by the pompous upperclassman then serving as its editor. Did I really allow one senior with a bad attitude to derail my entire life plan to become a writer? Could I have been so insecure, so ready to fold at the slightest obstacle? I think there were enough distractions and alternatives at the time that I just shrugged my shoulders and decided to fill my time with other things. How could I have cast aside writing so easily? All I can guess now is that the book's worth of pages I typed for my English, history, and Spanish literature classes kept me writing so endlessly that my creative writing inclination just quietly slipped into the shadows while I wasn't paying all that much attention. The desire is beginning to stir again, though, and I am at a place in life where I have the time, energy, resources, and wherewithal to heed its return. Last week I pulled all my writing books off the shelf--Bird by Bird, Writing Down the Bones, The Right to Write, Writing Motherhood, Pen on Fire--and dusted off my scrawny one-subject notebook to resume Morning Pages, a la Julia Cameron. And today I took the next big step. I invited my friend Mindy to be my writing partner and my Friendly Reader. We decided to meet weekly for writing and sharing, while also committing to writing daily in between. We are going to do our own Morning Pages, complete the Set the Timer exercises in Pen on Fire, and share other interesting writing prompts and activities with each other as we run across them. I usually sit around and think about plans and ideas and possibilities for months, sometimes even years, before I act on them. I am so excited that I only took a week to take major action to return to a real passion with roots all the way back to childhood. In The Right to Write, Julia Cameron asks, "What if there were no such thing as a writer? What if everyone simply wrote? What if there were no 'being a real writer' to aspire to? What if writing were simply about the act of writing?" She goes on, "What if we allowed ourselves to be amateurs (from the Latin verb amare, 'to love')." My plan is simply to write: to write because I love it, to write because I want to, to write because it makes my brain feel good. I have received some really fabulous examples of book arts, collage, and mail art over the past few months, and I have been saving up all the awesomeness to share with you at once. First, I had the great good fortune to receive a hand-made book from Karen at I Am Rushmore. Wow, what a tremendous giveaway to win! Is this a work of art, or what?! If you would like to check out Karen's other books (they come in all shapes, sizes, colors, and styles! ), check out all ten of the books she gave away here. I have received some fun and fabulous mail art from Pamela of Cappuccino and Art Journal. I am always assured of eye candy when something from Pamela shows up in my mailbox. She even created a lovely little mail-art themed notebook (bottom right in the photo above)! Finally, I have received a treasure trove of art from Karenann in the mail over the past several months. Please take time to study these awesome collages; looking at her work is just as good, or even better, than any of the books about collage or mail art that I have had the pleasure to read. It is such a pleasure to build these online and in-the-mailbox friendships, and to share our art and interests across the miles. I am developing such a delightful collection of artwork from these relationships, and would like to find ways to display the pieces, both to give them the respect they deserve and to be able to enjoy them as I go about my own creative pursuits. How do you collect and display all the wonderful things that make their way to your mailbox?? I used strips of decorative tapes...super simple! to write the following: "Trust in the process. Enjoy creativity every day. Just begin. Dream big. Start small. Is it in you? Use your voice." You've already seen this one! You've already seen this one, too. I can't seem to put those alphabet stamps away! Experiment! It is good for the soul. I made these based on an exercise in Quinn McDonald's book, Raw Art Journaling. Another card based on an exercise in Quinn's book. I added some of my glitter pen to some of the spirals, but it doesn't show up here. For more information about the ICAD project, check out Tammy's web site, Daisy Yellow! How do I know that my husband is perfect for me? I have been working on expanding the features of my blog, and have most recently added two new pages for your enjoyment and inspiration. At the top, next to the "Home" tab, you will see a tab for "100 Creative Actions" and a tab for "Quotations." I was greatly inspired by lists from Hanna Andersson, Mary England, and Keri Smith to create my own list of 100 Creative Actions--including projects/ ideas/ inspirations that I have already acted upon, as well as things I would like to accomplish in the future. Please check out this page for some creative inspiraton, and visit the links provided for enough ideas to keep you creatively busy for years. I invite all comments on the 100 Creative Actions page regarding additional creative ideas, or stories of how you have used these prompts yourself. Also, since I have been collecting quotations for as long as I have been able to write them down, and because they are so inspiring and useful in creative work, I have dedicated an entire new page to some of my favorites. I invite comments on the Quotations page, sharing your own special favorites and how you use them to inspire and create your work! I've been collecting all of my favorite quotations in a basic spiral notebook from Target. I am planning to add an "About Me" page, as well as a page that includes links to favorite projects and tutorials, both from my blog and from the rest of the online world. Thank you for continuing to visit and comment as my blog continues to develop and grow! As you might recall, I was lucky enough to receive a (signed!) copy of Quinn McDonald's Raw Art Journaling: Making Meaning, Making Art in a Found Poetry contest she held on her blog. I have been enjoying my look through her art journaling book, and found myself especially drawn to her Over and Under Drawings and her Free-Floating Bubbles. Creating these drawings has a definite Zentangle benefit, and I thought I would share the fruits of my doodling. Okay, I have to admit that I am especially a fan of the little movement lines on some of the balls, which make them look like they are zooming around on the ribbons! I even added a little shimmer with my new glitter pen on this one; can you tell?? A little shimmer on this one, too! I create most of my art with preschoolers at my elbow, looking over my shoulder, jostling for position and threatening to send my pen clear across the page. I consider every completed project a triumph as a result of those circumstances. And Quinn's art journaling exercises offer a meditative benefit to boot, which I have managed to benefit from in stolen moments when the girls are busy playing outside, in between demands for me to throw a beach ball around with them or monitor them on their scooters in the driveway! "Put your hand to paper, and you can be as creative as your day demands," Quinn tells us on her page about the free-floating bubbles design. Indeed, my days demand plenty of creativity for sanity, and I thank her for some new art journaling "tricks" to keep up my sleeve! By the way, I am busy turning these designs into postcards, ICADs, and ATCs, in addition to art journaling pages. Multi-tasking at its best! I was thrilled when Tammy of Daisy Yellow asked me to be a hostess in her Index-Card-a-Day (ICAD) challenge, and I chose "alphabet stamps" as my theme to share with you. After all, when it comes to graphic elements, the alphabet is one of my favorite things! This project is all about low-pressure: optional prompts, start when you can, play around, and if today's index card doesn't turn out so great, there's always tomorrow. All that changes when you are asked to be a hostess! Suddenly, your index card isn't a playground, it's a museum piece; people are going to come by and look at it! Yikes! However, not only was I able to bring myself back to a sense of play and experimentation with this index card, I got so comfortable with the process that I even cheated a little bit! Let me explain. Going to the StampArtScrap Tour event on Saturday brought me back to trying various supplies that I have owned for awhile but have not really used. Something about all those Tim Holtz products for sale lured me into trying the little bottles of alcohol inks that have sat unopened in my studio for months. I used Adirondack alcohol inks in earthtones, and just smeared them around on a couple of index cards. Then I pulled out a slightly glossy white tag and played around with them some more. They blend and mix a lot better with the slight gloss. Another supply I have that I never seem to use is my Versamark pad. That's when the alphabet stamps came into play. I stamped the tag with A to Z, then back to A to E to finish filling in the space. I used an alabaster chalk pad to rub over the top of the tag surface. I guess I expected the tag to turn alabaster while the ABCs remained the colors of the alcohol inks (being a Versamark pad, and all), but the letters turned lightly white and the inked surface retained its color. It still looked good to me. Then I used a new stamp from Stamp Camp, this awesome dragon that is showing up in everything I am making these days because I love him so much, along with a flourish from Stampin' Up, which I used as his fiery breath. I outlined the tag, the dragon, and the flourish with my new Sakura Gelly Roll glitter pen, et voila, my alphabet index card. Oh, wait...but I did all this on a white tag. And here is where the cheating comes in. In spite of the fact that the tag is just the tiniest bit larger than an index card, I glued it onto one of the cards I had initially smeared with alcohol inks, and am hoping that I won't be in trouble with our illustrious teacher Tammy for bending the rules a bit! And just because I had an additional index card smeared with alcohol inks, I stamped the ABCs on that second card with plain black ink and outlined the letters with the glitter pen for another shimmery alphabet card! The shimmer doesn't quite show up here! I am having great fun playing along with you all in this ICAD project; thanks for coming by today to see my experiments!